As our world becomes increasingly digitized, there is something about a local bookstore that simply will not “go gentle into that good night.” Against all odds, our top New Hampshire book sellers have forged onward, offering personal service and local enrichment one simply cannot find elsewhere. Keep funds in the community by making a trip to your local book monger, an investment not only in yourself but your neighbors and family as well. Ranked “Best Small Book Shop in New England” by Yankee Magazine, Sheafe Street Books is a beloved Portsmouth staple. A huge selection of all genres—from poetry to prose—and a thoughtful array of first editions, offered up by a loving owner and his constant companion, Petunia the Cat. With locations in Keene, Milford, and Peterborough, Toadstool Bookshop has quite a big presence in our little state. Keene’s newest iteration boasts a roomy location packed with books and programs. Lectures, as well as discussion and writers’ groups, are offered with stunning regularity, and community involvement has become paramount at all three locations. New Hampshire native authors often autograph copies of their books in stock, making a trip to Toadstool an easy way to support local economies on multiple fronts. With a giant selection of used merchandise, Baldface is a haven for booklovers on a budget. After 25 years, this Dover institution has curated an inventory perfectly suited to its community, from the written word to audio selections on vinyl and CD. Loads of events, including concerts and readings, make Baldface Books an independent gem of a shopping experience. As the largest independent bookstore in Northern New England, in continuous operation since 1898, Gibson’s Bookstore is able to offer not only a huge inventory, but also the amenities usually associated with national chains. Heavy hitters, including Jodi Picoult and Jonathan Franzen, have graced their special events, of which over 100 are offered per annum. In 2013, Gibson’s galvanized their children section by merging with a toy store, making it a one stop shop for the little ones you love. Offering an adult book club, toddler story time, and group opportunities for younger readers, Gibson’s deep connection to the Concord community is no mystery/thriller. Located in Portsmouth’s old Custom House and Post Office, a gorgeous building erected in 1860, Book and Bar is truly a singular experience. Offering espresso, craft beers, wine, Bloody Marys, and exceptional small plates, book buying has never been quite this indulgent. Though they observe strictly Wi-Fi-free weekends, an abundance of events and incredible book selection easily cancels out any low-tech stress. Water Street Bookstore is a bibliophile's fantasy, adding a distinctly local bent to book buying. Join their book group, find help selecting a work for your own club, or attend a community book discussion at this Exeter mainstay. Enter into their loyalty program—where $20 gets you 20 percent off for a year—and support local business and your book obsession in one fell swoop. Big city stacks with small town service, The Country Bookseller is truly the best of both worlds. Browse a sizeable selection while enjoying coffee, smoothies, pastries or gelato, all available at the on-site Book Nook Cafe. For over 30 years, residents of both Manchester and Nashua have flocked to their local Book Cellar for great service and selection. 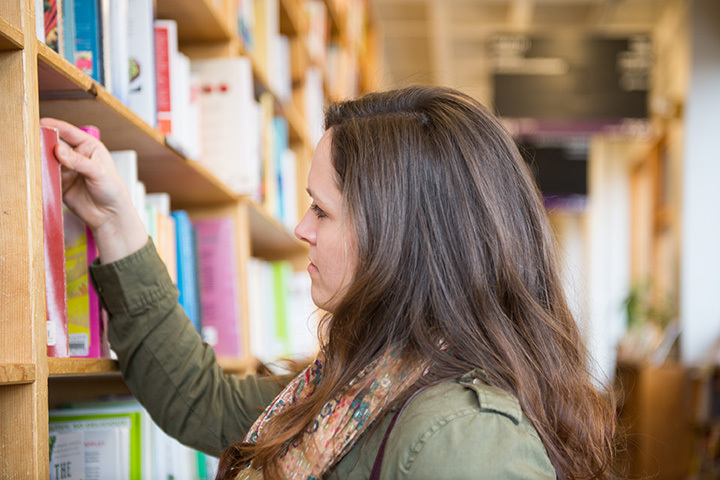 Though the bulk of their business comes from online textbook sales, a stop at their brick and mortar is worthwhile, either to sell your own used texts or have a look at their extensive inventory of books and locally-made goods. As only the second bookstore in the United States to rely entirely on solar power, MainStreet BookEnds is constantly looking to better their status quo. Alongside the typical bookstore offerings, this Warner location offers quality selections in quirkier categories like homesteading and organic farming. An attached gallery space offers yoga, book clubs, lectures, concerts, and readings, and attendees are encouraged to bring their children along for the experience and exposure. Ask about their Friends of MainStreet BookEnds (FOMBE) program, where $20 can buy a yearlong, 20 percent discount.